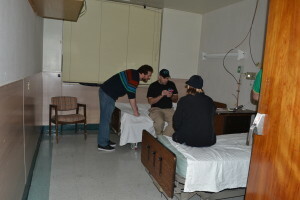 Castle leading a group in an EVP session at Asylum 49.
planning to sell tickets to the event to the public, but you don’t have investigators to lead the groups? Let WISPS help! WISPS will provide equipment, investigators, and manage the event. WISPS will work with and coordinate the event with the planners for a smooth and seamless event. WISPS regularly staffs public investigations on a monthly basis.